Posted on October 14, 2007	by Linda S.
A while back I made some crocheted socks for DH using the first homespun I did before the spinning lesson. He likes them so much he decided that I needed a pair, so I made me a pair. Have to admit that mine are a lot softer than his, even tho crochet is not nearly as soft as knitting. I have made these socks before using the pattern from Grafton Fibers…easy Toe-Up Crocheted Socks…but I find that using the homespun 100% wool is a LOT warmer than using the acrylic yarn I had purchased. 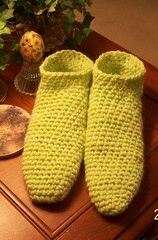 This entry was posted in Crafts, Crochet, Free Patterns, Handcraft, Handwork. Bookmark the permalink.